ComPet is a full-cycle game development project for MindArk AB, a Swedish software company. Customer required a mobile game with a real cash economy, enchanting art, and PvP multiplayer support. N-iX generated the concept that combines a city-builder strategy with a turn-based combat game. We implemented the entire project including game design, prototyping, development, art production, and post-production. A special AR playing mode will be implemented in the future release. ComPet is a cross-platform game, developed for MindArk AB, a Swedish company famous for its sci-fi MMO PRG Entropia Universe. Our client wanted to extend their success with the real cash economy games to mobile platforms. MindArk decided to launch a new project that would resonate with wider player audiences. Game localization for various markets. Additionally, MindArk wanted to link ComPet with their most successful game, Entropia Universe. Our artistic team reproduced several characters from Entropia in the new project. 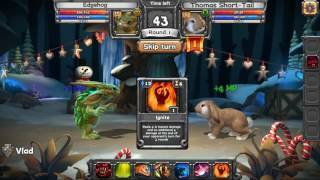 In Competition Pets (or ComPets) players collect battle pets and clash with other players in the arena. Outside the arena, each player has a village where he can harvest gold, train pets, buy additional upgrades, and more. ComPet is a multiplayer game where players can bet in-game gold or real money when they battle with the opponents. Real cash economy means players can cash in money and withdraw it to PayPal or credit card account when needed. Our team developed a cross-platform game for PC and key mobile platforms. At the end of March 2017, the game had around 150 000 downloads across all platforms. ComPet is an exciting midcore game with a challenging gameplay. Players need to spend some decent time playing the game to master the skills and eventually dominate their opponents. Buying pets and upgrades crucially speeds up the progress. “Rare” playing characters you can buy in the store. Betting system with real cash economy. MindArk are completely satisfied with the job our team put together. N-iX Interactive continues to work on the project with live operation, game patches and upgrades, season tournaments, and art support for marketing and advertising. We also develop a special game extension that would allow playing ComPet in the augmented reality mode. You can download ComPet from Google Play, iTunes, and Steam.